Anna Getty is a woman on a mission. Not only is she an heiress, chef, actress, fashionista, and author of multiple books -- to mention just a few of her talents. She is also a mom who lives and promotes living green in every facet of her life. The holistic living expert's latest title, Anna Getty's Easy Green Organic, may look like another healthy, organic cookbook judged just by its front cover. But, once opened you'll have a whole new perspective and will read, see, and learn so much more. This is actually Getty's second title for Chronicle Books. Her first book published last Fall, I'm Dreaming of a Green Christmas, was selected as both one of the best gifts for 2009 last year for Thanksgiving and Christmas . Some similarities do exist between the old and the new -- for example the strong influence the author's daughter and husband have had on her wonderfully elegant prose. Another is the beautiful photography by Ron Hamad. All this is artfully interspersed with shocking but motivating statistics, resources, and all manner of valuable information on what each of us can do to help our planet while also living more richly. Besides that, both soft covers are practical filled with how to advice for creative souls while also appealing to the many more pedestrian readers who likely will appreciate these equally as conversational pieces and as coffee table books that are inspiring just to thumb through. What sets Easy Green Organic apart from its predecessor, though, is that while Getty's first publication draws from nature and is focused on how to create gifts, decorate and entertain for the holidays, her new book just released this month is all about cooking, eating, and living organically year-round. Notably, in the more recent title, there are 75 more pages to absorb and enjoy -- thanks in large part to Dan Goldberg, noted food photographer who has teamed up with Hamad -- to create some particularly delectable color visuals to accompany the recipes. It's hard to choose what is the best thing Easy Green Organic has to offer us because it covers such a broad range of territory. On the one hand, there is the opportunity to learn about what sustainable farming and shopping organic is all about. How we can embrace these things to help us cut down -- or even more ideally, eliminate all together -- exposure to pesticides through the produce our families eat. For sure, having access to food that is not only good for us but absolutely delicious as well is also the goal. In this book, Getty answers these desires by sharing new and inventive recipes that are both healthy and easy to prepare such as "Baked Portobello Mushrooms With Avocado and Pesto" and "German Potato Pancakes With Turmeric Pear Applesauce and Chive Creme Fraiche," plus many more similarly tantalizing dishes. All love is not lost just on the adults, either, in this book. Kids are going to love her ideas, too. I mean, what youngster is not going to like these treats? "Sweet Potato Fries With Maple Barbecue Sauce," that are baked rather than fried, "Juliet's No-Fail Banana Bread with Dark Chocolate Chips," and much more. 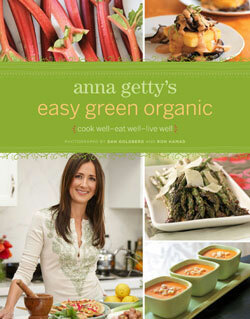 Anna Getty's Easy Green Organic, $24.95, was published in 2010 by Chronicle Books and is available at major booksellers. WIN this book. To enter this MommyBlogExpert Book giveaway, simply read this review and leave a comment below this post telling what you like most about Anna Getty's Easy Green Organic. Don't forget to include your email, Twitter or Facebook info so we may contact you in the event that you are the winner. Eligibility: must be legal resident of the U.S. to win with limit of one entry per person. Contest ends at 11:59 pm PDT on May 15, 2010. FTC Disclosure: MommyBlogExpert received a copy of the book reviewed. For this MommyBlogExpert giveaway contest a copy of Easy Green Organic is being given a way to one lucky contest winner. MommyBlogExpert did not receive any payment or other compensation associated with this post or giveaway contest. See complete FTC Disclosure information that appears at the bottom of MommyBlogExpert's main page and at the bottom of every individual post on this blog, including this one. I want this book just for the Portabello Mushroom recipe. Well that and I am still new to this organic stuff and I can take all the education I can get. Love reading informational books, including cook books. Always looking for a way to be greener - cooking can be one of them if I win! MamaOtwins+1, and EVERYONE ENTERING, don't forget to leave your email, Twitter or Facebook contact info in the body of the comment so we can contact you if you win. I think this looks like a great book to help me green up my life! I'd love a chance to win! This book sounds beautiful- I love cookbooks with whimsy and beautiful pictures and this sounds like it would be right up my alley. Were also long time vegetarians and always looking to find more green coooking ideas. book sounds absolutley wonderful, learning how to shop and live organically.....much more healthier!! Plus I want that Banana Bread recipe with the dark choco chips!! The recipes sound fantastic! drooling. I've been searching for an organic cookbook and since the author had such a great book last year I would love to look at this one!